If you ever thought there was a better season than fall pie season I am here to tell you that you are woefully ill-informed. Off ALL the food seasons out there - tomato sandwich season, chili season, asparagus season, fall pie season is the clear and obvious winner. But let’s be honest - making a pie from scratch can be intimidating for those who aren’t regular bakers. Plus, with all the insanity in the kitchen on Thanksgiving Day it can be hard to even find the oven space to bake a pie! Never fear - some of my favorite local restaurants and bakeries are here to rescue you, with delicious pie of course. These shops know pies, rest assured you won’t be getting any grocery-store quality, soggy-bottomed sorts from them. So skip the kitchen hassle this year and put a locally-made, delicious pie on your Thanksgiving menu. Your guests (and your tummy) will thank you. Durham’s favorite downtown diner is rolling out a new pie menu this fall, and you can order whole pies to take home with you! They have two amazing options to choose from (we were lucky enough to try both the other night at a media preview) - I loved the NC apple with New England cranberry pie, and Harper (and most of the rest of our table) was enthralled with the Pumpkin Chiffon Pie with House-made Coolwhip. But why choose when you can order both? I have to put a plug in for my neighborhood coffeeshop, but not just because it’s right around the corner from our house. Ali’s pies are fantastic, easily some of the best in the state. I once plotted out an afternoon run so I could swing by one of her pop-ups and ended up running three miles home with a slice of pie in each hand. 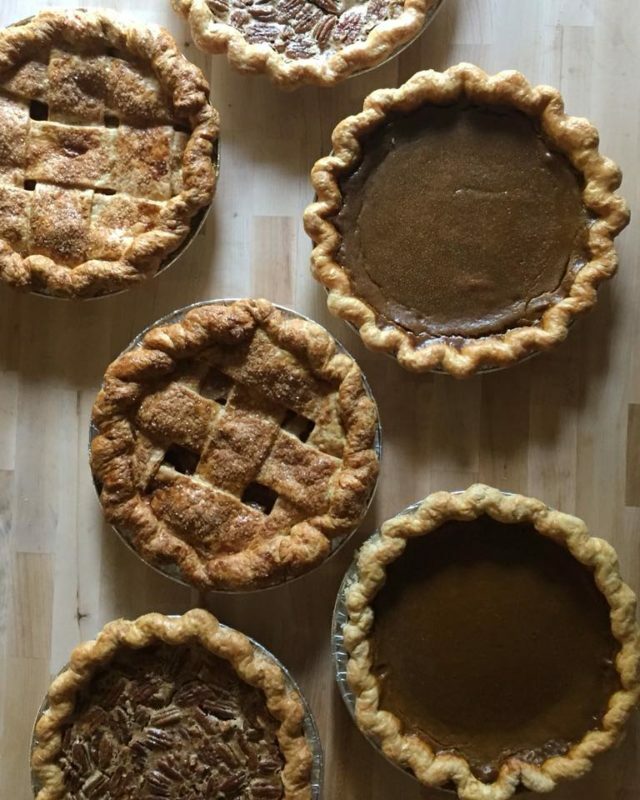 There are six pies to choose from this year including Cranberry Pear Crumble, Dark Chocolate, and Malted Pumpkin.